Our staircase makeover is finally underway! 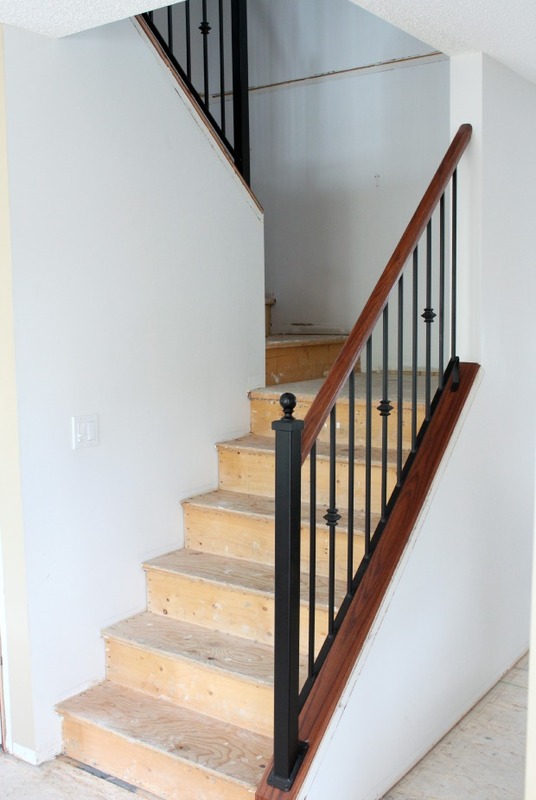 Take a look at the progress we’ve made plus all of the gorgeous hardwood staircase ideas we’re using as inspiration. Hello All! Having a good summer? I wish I could say the break I took from blogging the past couple of weeks was vacation related. Enjoying a good book on a beach would be amazing right now, wouldn’t it? Instead, I’ve been running around selecting finishes for our entire main floor renovation and ripping apart everything that’s about to get a facelift. To say it’s a bit dusty around here is an understatement! 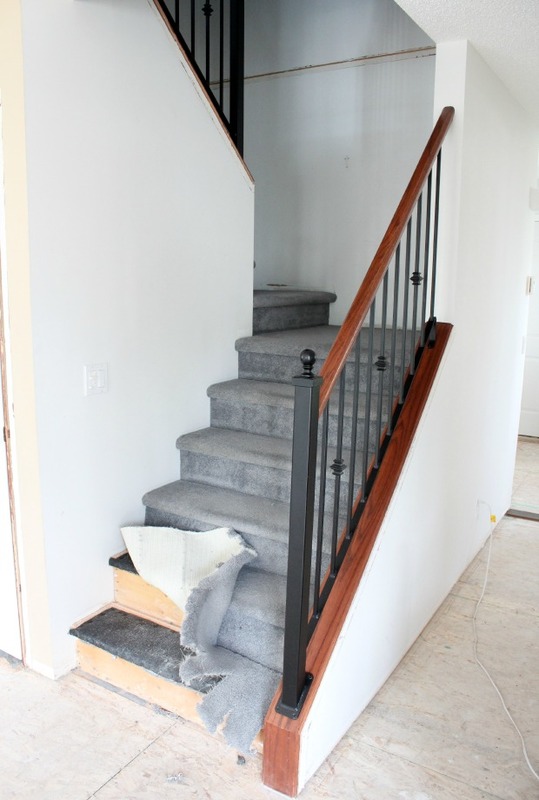 Today, I thought I’d take a break from it all to show you the basic plans for our staircase makeover, as well as some of the progress we’ve made on it so far. 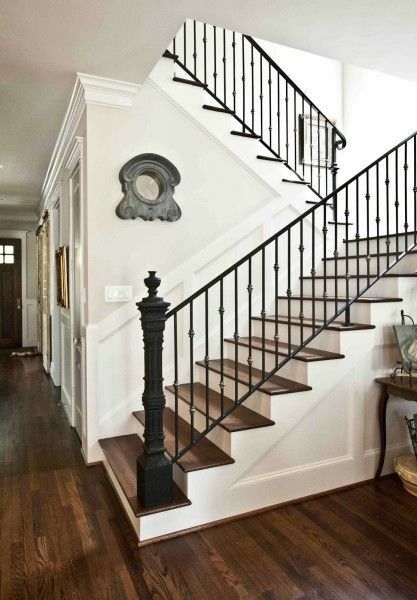 What I love most about each of these staircases is the contrast between the darker hardwood treads and the white-painted risers. 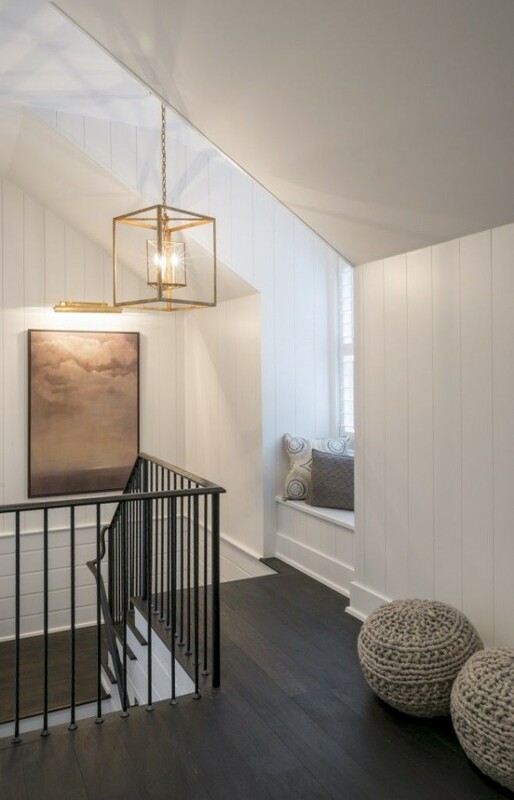 I’m also drawn to the light walls and fresh white trim, which are also a good transition from one level of the house to another. Up until last week, we had dingy grey-blue carpet that had definitely seen better days. I’ve wanted to get rid of that carpet since the day we moved in. 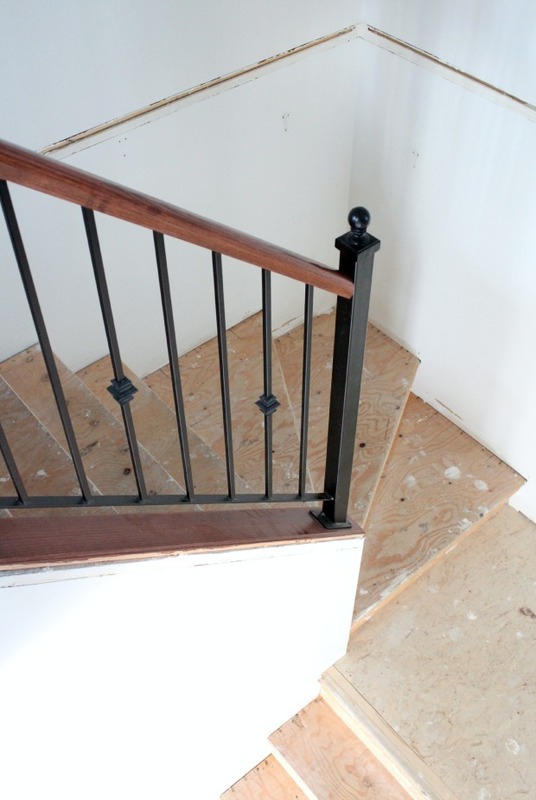 But installing hardwood on the stairs is expensive and time consuming, especially when they wrap around like ours do. We’ve lived with them for years and years, and I believe the only one who liked them was our dog Reegan. They were her favourite place to sleep (so convenient as we carried baskets of laundry and other stuff up and down the stairs- NOT!). As it turns out, there isn’t much drywall patching to do after removing the carpet except for the landing and pie-shaped steps. Most of the gaps will be filled once the hardwood treads and MDF risers go in. 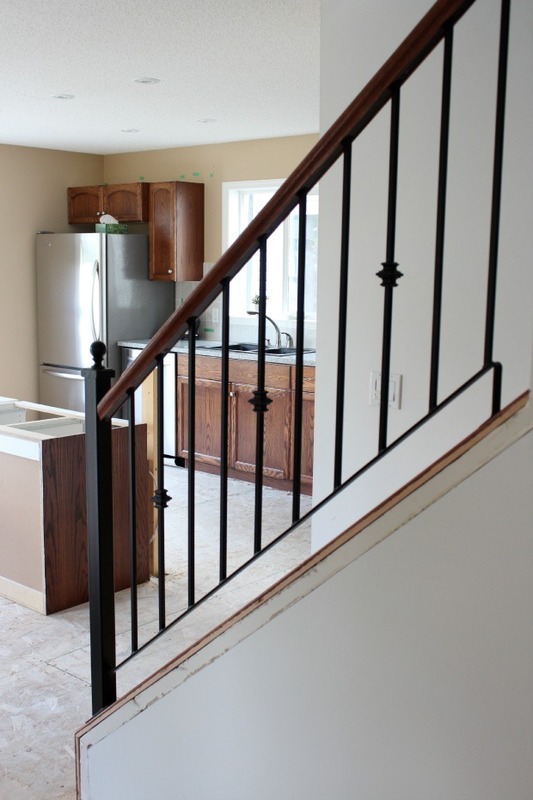 We will be doing some of the work ourselves, like stripping and staining the handrails and painting the risers. However, we’ll definitely be calling in the experts for all of those tricky cuts. As you can see, our old kitchen island is almost out. I like how much better it looks without that raised countertop chopping the space in half. The plan is to repurpose those cabinets for extra storage in my basement workroom. That project will have to wait since most of our kitchen is packed up in boxes and taking up the majority of that room for now. I don’t think there’s one room in the house that isn’t a disaster zone right now! That’s all I have for you today. The rest of the kitchen will be taken down this week to make room for the new cabinets. The only other demolition we have left is our laundry room floor and some window trim. Only one more trip to the dump- yippee! 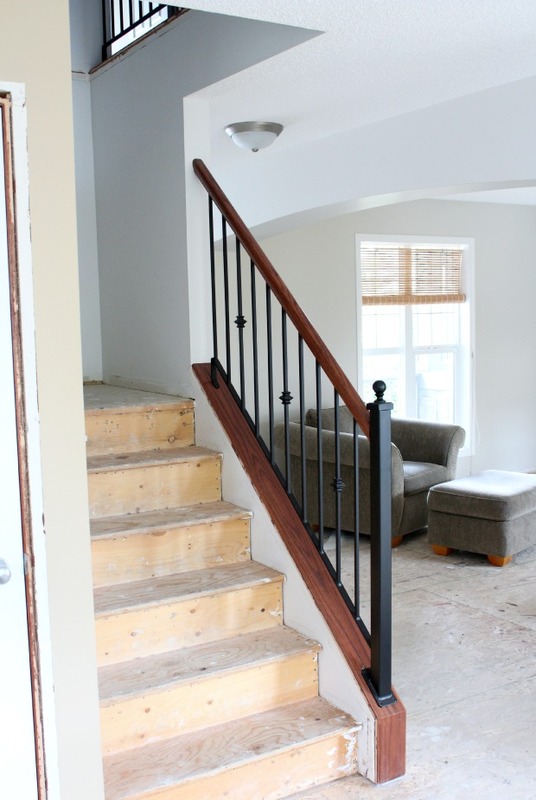 Update: Click here to see our beautiful new hardwood stairs! Wow! You have been busy! I can’t wait to see the results. It will be worth the time, effort and $$$. Love the island gone too – it opens up the whole area. Oh!! Can’t wait to see the finished result! I’m sure it will look wonderful! Great job! 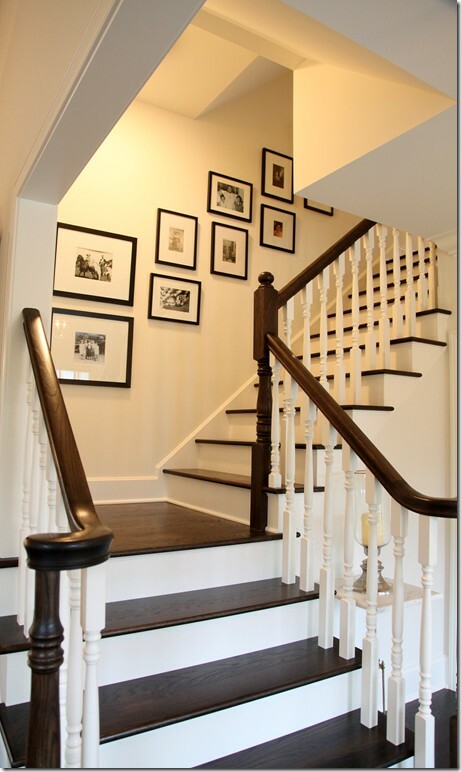 All your hard work will pay off Shauna and judging from your inspiration photos that staircase will look just beautiful! I love where you are going with your stairs – this look is by far my favourite, and I can’t wait to see yours when they are finished. All your hard work is going to pay off!! Thanks Sheila! Can’t wait until it’s all finished! Can you tell me where you found the gorgeous pendant in the stairwell? Hi Mere, I believe it’s the Morgan pendant by Troy Lighting.